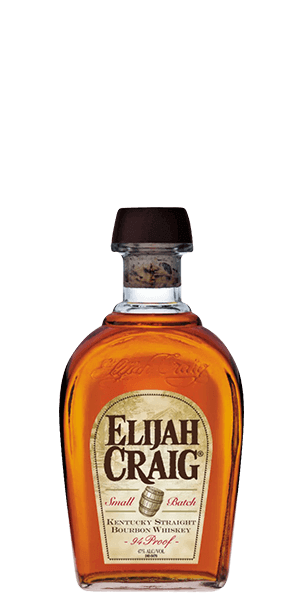 They say Elijah kind of invented Bourbon. Well he didn’t. Great man though! This Kentucky Bourbon is made by Heaven Hill Distillers, the only remaining private and family-owned distillery in Kentucky, headquartered in Bardstown. In 1996, Heaven Hill's production plant was almost completely destroyed by fire. The company survived and while fermenting, mashing, and distilling now occurs at the new Louisville distillery, aging, bottling, and shipping still occur in Bardstown. Elijah Craig Bourbon is named after a Baptist preacher in Virginia. He has sometimes been credited with the invention of Bourbon Whiskey. The story says he kept a warehouse where he stored barrels and one day experienced a devastating fire. He used the charred casks regardless and found they imparted a lovely character. All of the master distillers at Heaven Hill since its founding have been members of the Beam family. You know Jim Beam, yeah, that Jim, Beam Jim. What does Elijah Craig Small Batch 12 Year Old Bourbon taste like? The Flavor Spiral™ shows the most common flavors that you'll taste in Elijah Craig Small Batch 12 Year Old Bourbon and gives you a chance to have a taste of it before actually tasting it. Subtle with perfume and clover honey filling the nose, real Bourbon vanilla, with a touch of candy-store sweetness. Deep and rich in structure, rye, malty fruitiness and a touch of spearmint. Molassed sweetness and vanilla leave a lingering, smoky and phenolic finale. Delightfully flavorful and smooth. Easily as good as bourbons with a larger price tag. A nice boozy, caramelly bourbon. Nice spice. I'd say it's not as savory as Henry McKenna 10 yr BiB, but it's always in a siilar price range and one of the best under $40. Solid classic bourbon. All the normal notes plus a little peanut brittle. Perfect rye content for my tastes. Great whiskey but their age statement just left the building. Maybe the best value in bourbon. A bit hot and a tad bit too sweet for my tastes. I've had the barrel strength and thought it was fantastic, but this just wasn't quite as balanced as I'd hoped. Vanilla and caramel come through strong. I think this is a bit more of a rocks drink. But at this price point I have no problems keeping a bottle on hand. Sweet, vanilla, a little smoke. Very good for the price! Very underrated Bourbon. And great value. Best bourbon for it's price range by far. Tasty and complex. Great neat or mixed with ginger ale.